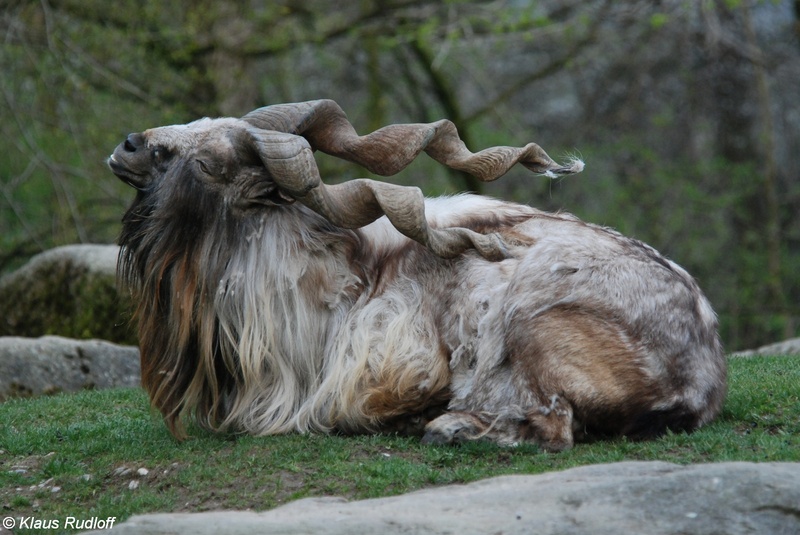 Today I want to write about an animal that has very impressive horns, the markhor. These impressive goats can grow to up to 180 cm long from head to tail. The males are much taller and heavier than the females. One of the most amazing things about markhors is their long, twisty horns that can grow to up to 1.6 metres long. These horns are used to fight with each other during breeding season. The males also have long, shaggy beards. Females have horns too, but they only grow about 25 cm long. Like many other species of goat, they are excellent climbers, which they need to be to escape from predators such as snow leopards, wolves, black bears, leopard cats and lynxes. Golden eagles can also catch young markhors. They are strict herbivores, eating leaves, grass, fruit and flowers. They have a very important role to play in the eco-system as they spread seeds through their dung, helping plants to flourish in new areas. Markhors live in the mountainous regions of Pakistan, India, Afghanistan, Tajikistan and Uzbekistan. They are the national animal of Pakistan. They are considered endangered and there may be only 2,500 left in the wild due to hunting and habitat loss. Are there any other interesting facts that you would like to share about markhors? This really helped for my biology project thank you. This really helped with my animal trading cards on my Afghanistan poster! Thanks!